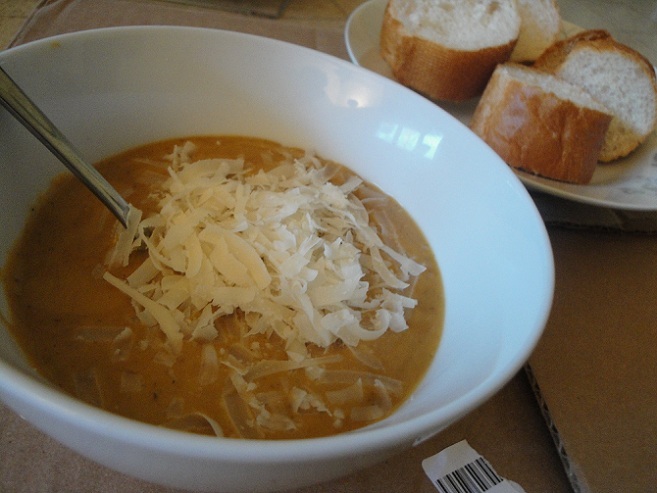 seeing as the weather is cooling off & soup is now appropriate for lunch and seeing as i cant allow myself to keep this recipe on the weekly repeat, i was SO happy to find another delishious-sounding recipe here. i sort of “made it my own,” since i didnt have curry and since i wanted to add in some mushrooms. trust me, its good! now, go give it a try! melt butter in a pan over medium heat. add onions and sauté until lightly browned, then add garlic and sauté for another few minutes. add in mushrooms and sauté until they are soft . stir in vegetable broth. bring to a boil and add in sweet potato cubes. cook until the sweet potatos are tender, about 25 minutes. add in coconut milk and sour cream, reduce heat and simmer for another 5 minutes. use a blender to purée the soup until smooth. top with freshly grated parmesan cheese & serve with sliced french bread. enjoy! next i would like to try this recipe! what are some of your favorite soup recipes?? Glad you enjoyed it, I love the idea of adding mushrooms, yum!